A nice article today on ITV Central News giving an update on our progress and the visit from Robert Jenrick, our local MP, who dropped in to see how we are getting on as we break the 100 subscribers mark. FIbre customers are now getting up to 300Mbps symmetrical – with plans to keep turning up the speed as we get more subscribers connected. Focus now is on bringing the fibre into the more built up areas in the centre of the villages. JFDI! Fiskerton and Morton – Digging together! Not a bad weekend’s work – Sports and Gala complete and a key section finished in Morton. Great to see so many people turn out and to have the mole plough in action for the first time. Same again next weekend?! Are you coming? Leave a comment or send us an email so we can plan for the number of volunteers. It may seem that everything has gone a bit quiet in the last couple of months, but behind the scenes we’ve been very busy getting everything in place. As a Community Benefit Society we are also a Limited Company, so there’s been a lot of work making sure that we are fully insured, registered for corporation tax and VAT, have a health and safety policy in place along with appropriate risk assessments, method statements and safety equipment, and we’re prepared to manage the build. should see the delivery of 26 telecoms chambers and the two cabinets that will house all our electronics. We also have the first batch of equipment needed to build the wireless network so keep an eye out for new access points appearing in the next few weeks. Ahead of the “Big Dig” on July 16th/17th we have started work on the main network, taking advantage of a mini-digger to install 3 primary ducts from the Sports and Gala, southwards along Cooks Lane. And Chris Price and Peter Hammond have been building and improving the mole plough that will make light work of the duct laying where we go round the edge of a field – we hope to have a demonstration of the mole plough at work at the Big Dig. What are the plans now? Over the coming weeks we will press on as quickly as we can to build the main fibre backbone between the Trent Valley Equestrian Centre and the Sports and Gala. The Big Dig is a start, but we will need more volunteers to complete the work alongside any mole ploughing. The target is to get fibre backbone live over the summer – ideally by the end of September if not before. We should know this week when our connection onto the national fibre-optic network will go live – there has been a slight delay due to blocked ducts between us and the nearest “fibre node” but we still expect to be live in August. The challenge then is to get everyone connected as quickly as possible. In Morton, there have always been problems getting a wireless signal into the village so we plan to install a fibre link to the main Morton wireless access point and to make this live as soon as possible. So the quicker we build the fibre backbone the quicker we can make Morton live. In Fiskerton, it will be easier to establish a wireless link to the Equestrian Centre which can be made live as soon as the backhaul goes live. The next step will be to start linking the Fiskerton wireless access points to the fibre network so they also get the full quality and speed of the fibre link. The initial connection fee is £210. There will be no charge to transfer from wireless to fibre so sign up now to make sure you are connected as soon as the network goes live. What about getting a fibre connection to every house? If your house is directly beside the fibre backbone (see map below) then you are lucky! We can connect you straight onto the fibre optic network, but you may have to wait a few weeks as we get the wireless access points in place and connected first. to lead the digging parties (with our support). Where it’s necessary to arrange a road crossing then we will sort this out (unless there any experts in the New Roads and Streetworks Act who would like to volunteer?). Wear stout shoes/boots and come equipped with spades, gloves an suitable clothing, rain coats, sun cream… Well we can hope, can’t we? A guide published by the Fibre to the Home Council Europe – “Fibre broadband”, “high speed”, “bandwidth”, “FTTC”, “FTTB”, “FTTH”… those who are not specialists in broadband services can easily feel confused about these technologies and seemingly obscure acronyms. In order to educate the general public on fibre to the home technology, the FTTH Council Europe released this year a new guide entitled FTTH – What is it?. The Council would like this guide to enlighten the concerned but novice citizen whose life is impacted by telecommunications, yet who feels a bit lost in this environment. The guide further aims to educate potential stakeholders who can help accelerate FTTH adoption and rollout throughout Europe, among them politicians, executives and of course consumers. These stakeholders need to be aware of the benefits of FTTH compared to other broadband technologies but also need to understand basically how it all works from a technical point of view. The vision of FTTH as “the future-proof technology” needs to reach as many people as possible within our society. This guide provides its readers with the most accurate definition of FTTH. What is optical fibre? How does it work? What are the factors that encourage fibre to the home adoption? From the individual components to the overall network infrastructure, the guide gives an overview of the fundamental elements that constitute an FTTH network and that allow the optical fibre to reach the end user’s home. So, if you or someone you know is not familiar with FTTH technology and why it is so essential for future developments, this guide is made for you! Share and spread the word about fibre to the home! 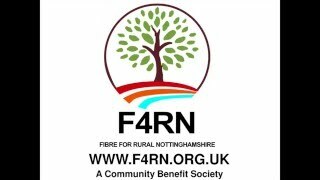 Thank you to everyone who has supported our community broadband project by investing in F4RN. We’ve now raised over £113,000 and have 100 people who have signed up to take up the broadband service as soon as it is available, with more planning to join us as soon as their existing contracts are complete. This is fantastic and, as agreed at the open meeting last week, we’ve met both the criteria needed to start the project. The plan now will be to cash the investors’ cheques and collect the investment made through the Microgenius site. Please make sure you have the funds available as we will start drawing down the investment next week (from 25th April onwards). With the funding in place we can start ordering equipment, arrange for the professional network survey and order the connection onto the national fibre optic backbone. In the coming months we will need a lot of help to build the network – particularly when we start to lay the ducting and fibre optic cable. The more volunteers we have the quicker and easier it will be, so please don’t be shy! Here is the presentation that we gave at the meeting for potential investors and subscribers on 17th April. It summarises the revised proposals based on the level of investment raised and the potential subscribers. The initial connection charge is £210. Monthly charge set at £36 for 100Mbps symmetrical broadband connection. Both prices include VAT. Initial 12 month contract. Connection will initially be delivered through a high performance wireless network with progressive overlay of full fibre solution as the community broadband network develops. Perhaps not the most riveting Sunday afternoon viewing, but if you missed the launch events or just want to review the presentation we’ve finally manage to upload the video. The slides are also available on our home page. Don’t forget, the share offer is open so don’t miss the opportunity to invest in your community. Great news – we’ve received advance approval from the HMRC for our share offer. This means that under the Seed Enterprise Investment Scheme, eligible investors should be able to receive a tax rebate of 50% of the amount they invest. So if you invest £1,000 you should get a £500 tax rebate! Great news – we’ve arranged for a demonstration of the fibre optic ducting at our launch meetings on Saturday 16th and Sunday 17th January. Simon Wade from Emtelle will be joining us to explain their microduct system and to answer our questions. He’s also planning a demonstration of how the fibre optic cables are blown through the ducting. We could all be experts by the end of the weekend!